We gather in community each Sunday morning at 11:15 to find meaning and live more deeply. Our morning assembly creates connections within, among, and beyond us, calling us to our better selves, calling us to live with wisdom and compassion. For many visitors, our hour together is very different from what they have experienced before. We are not “Wear your Sunday Best” people, rather we feel comfortable dressing casually. We are both inclusive and diverse. Inclusive in that together we are a community that include all who feel comfortable with us. Our inclusiveness embraces a wide diversity of religious beliefs – Atheists, Agnostic, Believers, Buddhist, Christian, Doubters, Free Thinkers, Jews, Humanist, Muslims, and the list can continues for pages. It is our individual religious or spiritual diversity that pulls us into community. Our diversity doesn’t stop with our differing beliefs, we also celebrate differing lifestyles. We are bi, black, brown, differently-abled, employed, gay, lesbian, old, retired, straight, transgender, white, young, and a lot of other things. Our point is simple. It takes all of us being together to weave a tapestry of loving affirmation that strengthens our community. Such a diverse gathering is often the grist for the mill of lively conversations. For those who like to participate in a discussion group, our Adult Forum meets each Sunday at 10. The Forum selects topics, often from The Great Courses Series. They watch a video and have a discussion following. We hold an hour of quiet meditation, in the chapel, starting at 9 for those who enjoy centering their thoughts to start the day Note: Meditation will be on hiatus beginning February 3, 2019. Unitarian Universalist worship styles vary by congregation, for us we are not bound to any one holy book but many, drawing upon the writings of Christian, Jewish, Muslim, Humanist theologians as well as bringing into our assemblies the written words of the world’s philosophers, and modern authors. Each week our assembly begins with the ringing of a Tibetan bowl which calls us to stillness so we may be more present as a beloved community. 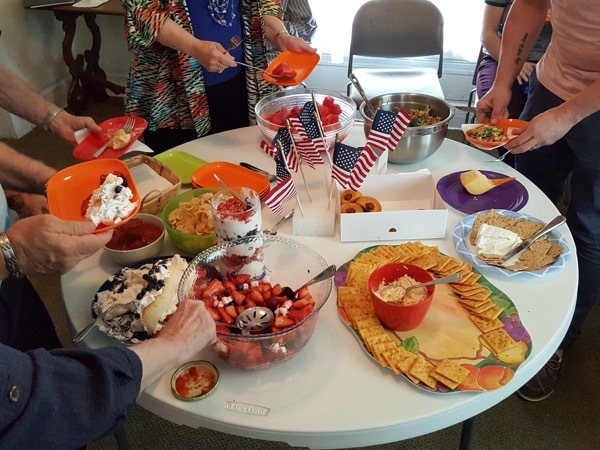 One of our worship associates provides a focused Call to Community after which people are invited to go to a table and light a candle for whatever personal reason they may have – be it a joy or a concern – while we sit in stillness and listen to a prelude. Love is the spirit of this church … and service is its law. To seek the truth in freedom … and to help one another. 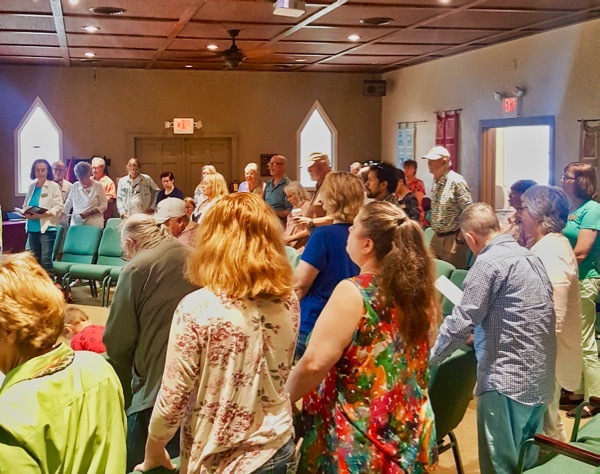 Each Sunday Assembly centers around a specific theme, articulated – in depth – by the remarks of the visiting minister (in person or on video) or lay person. Prior to listening to the guest speaker, the stage is set, so to speak, with an opening thought, a couple of songs, a reading or two which augment or expand the morning’s theme. Unitarian Universalists have a songbook Singing The Living Tradition which was published in 1993 replaced an earlier edition that was dominated with male-center verbiage and needed to be more reflective of our commitment for inclusive language. At the time Singing the Living Tradition was the most diverse and inclusive hymnal in publication in the world. Since then a supplement songbook Singing The Journey was published in 2005 which expanded our singing opportunities with more current and upbeat selections. Some Sundays we sing 3 songs, other times fewer, or even none. We pause during each assembly for Practices – a three-part segment that begins with a meditation, poem, or prayer followed by quiet sitting for a time and concludes with a musical response. Following the speaker’s remarks (roughly 20 minutes) we pause, as probably every church in the world does, to give ourselves an opportunity to bring our gifts to the table in support of the work of our church (and to pay the bills!) We conclude in song, followed by a parting thought or benediction and extinguishing the chalice. Our assembly is an hour, starting at 11:15 am. We then tarry for what we call Conversations & Calories (our take on the traditional coffee hour). The Good Times Teams, 4 in number, rotate to provide the “Calories” portion, and everyone eagerly participates in “Conversations”. Then there are the Sundays when our speaker elects for a 40-45 minute time period for their comments, which often includes an informal Open Dialogue (our term for a Questions & Answer) relating to the morning theme. Several times a year we have an All Music Sunday either with a touring UU musician or an assembly we design on our own. We often tell visitors that to get a real flavor of Sunday mornings at Red River, one needs to visit 4 or 5 times because what happens one week mightn’t not happen again for a while. You can get a quick flavor of the diversity of our Sunday morning assemblies by looking through the current issue of Red River Ramblings our monthly newsletter, or check on our church app which is updated weekly.